I write this report from our nation’s capital, Washington, DC, where several staff members have joined me, attending the IBEW Construction and Maintenance Conference and thereafter the North America’s Building Trades Unions Legislative Conference. IBEW Local Union officers and representatives from across the country met to discuss and report on the status of work within their jurisdictions and steps to continue the growth and capture of more work for their members. International President Lonnie Stephenson and Secretary-Treasurer Kenneth Cooper spoke on the progress and future of the IBEW. Informational workshops were available and attended by Local 11 staff, presenting us with new ideas in the representation and protection of our members. The first morning ended with an appearance by former Vice President of the United States, Joe Biden, who gave a speech many of you saw on your local news. The next few days will be spent on legislation which will affect unions and the Building Trades, culminating with a day to meet with our representatives and present our views. These conferences and meetings are necessary to ensure we protect your hard-earned wages and benefits. In future correspondence, I will list all that are available to you. Every member has benefits which are specific to their classification and should be maximized. You work and earn these, so why not enjoy them? Make sure to keep track of hours reported by the employer. Save your pay stubs and check your quarterly benefit statement. Sometimes hours are unreported, misreported or late to the IBEW-NECA Trust Fund administration which affect your coverage and contributions to these funds. I know it is a pain for apprentices to note and report work hours, but this is to prepare you to continue monitoring your hours. Every hour counts! Be sure to register on the Electronic Reciprocal Transfer System (ERTS) at the IBEW-NECA Trust Fund offices in case you work outside Local 11 jurisdiction, so your benefits come back home and are credited to your accounts. Some locals don’t participate in this, so inquire to make sure you are covered and make an informed decision. In the Sound Unit, thanks to the hard work of Local 11 agents and the compliance office, Woods Electric was able to secure work for over 30 Sound and Communication workers in Kaiser Hospital facilities. Through our commitment to our NECA partners and cooperation of Kaiser, all work previously being self-performed by Kaiser Construction, will now be done by NECA contractors. 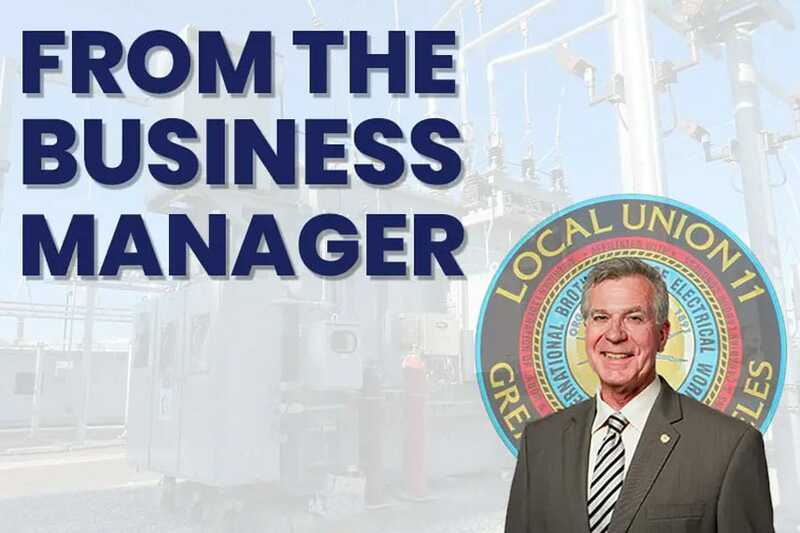 The usually reserved Ralph Woods couldn’t help expounding on the long history his family and the IBEW has in the success of his company. All parties were on hand for the conversion and we look forward to a long and continued harmonious relationship. Starting this month, all members being dispatched will be signing an “Authorization for Representation” card. This is to protect you and the Local’s ability to legally represent you on the job. Several agents have been visiting our contractors to sign 9a conversion documents and this is a continuation of the goal to be compliant with IBEW International mandates. While April will be a test, May 1st is the official start of this requirement. Call the Business Manager’s office or ask dispatch should you have any questions. I will end by reporting the progress of the Inside and Intelligent Transportation negotiations. Your committee has met several times, and out of over 300 proposals, will present NECA with 12 on Friday, April 12, 2019. Our first meeting is scheduled for Wednesday, April 24th, with six more in the following weeks. We hope to have a contract for your ratification by the Special Called Meeting scheduled for May 29, 2019 at the Los Angeles Convention Center. Thank you for all your suggestions and proposals and mark your calendar to attend this most important meeting. I am always honored to represent you and proud of the staff who serves you in so many ways.